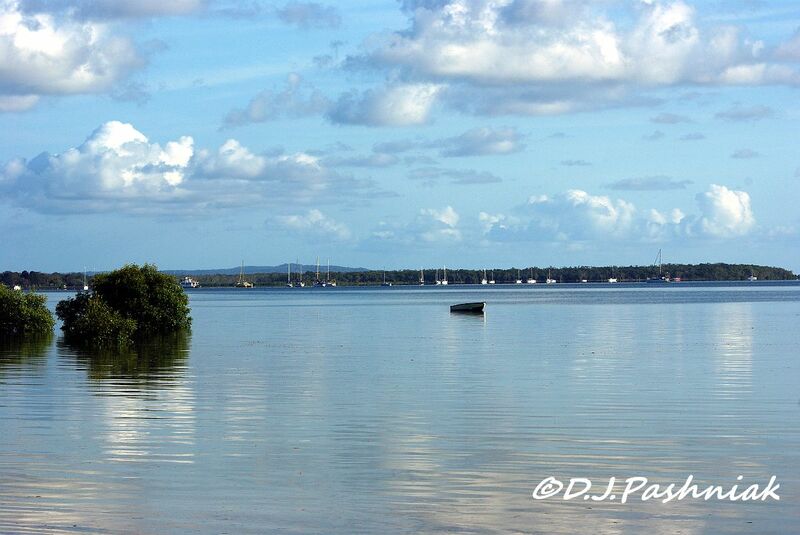 A walk along the foreshore at Tin Can Bay is quite different from a walk along the foreshore at Mullens and Cooloola Cove. 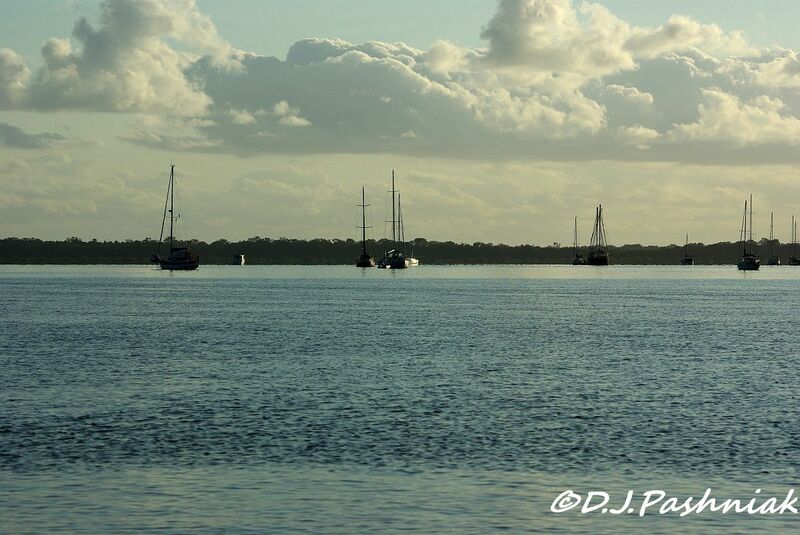 The bay is much deeper here so there are boats moored everywhere. This photo was taken from Norman Point looking north-east. Right at the point there is a sand spit exposed at low tides where the birds roost until too many people walk by. 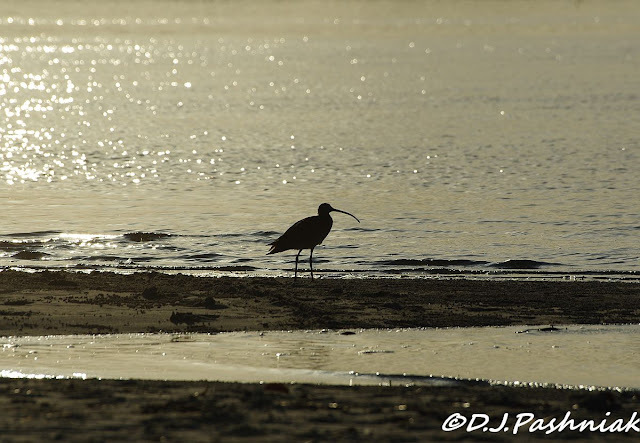 The other morning there was one Eastern Curlew roosting there and making a silhouette against the brightness of the early morning sun. 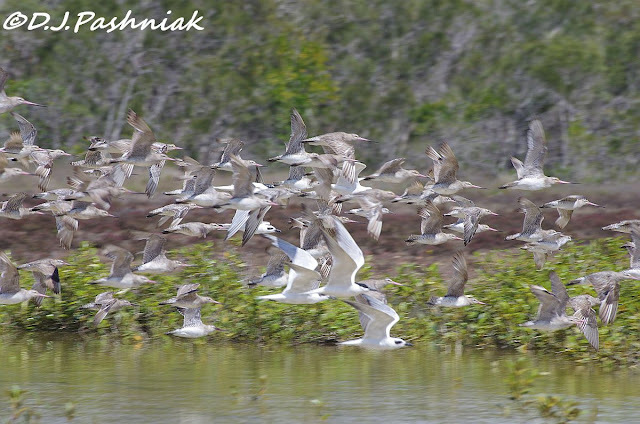 Shorebirds roost just south of the point when there is too much disturbance or the tide is too high. There were well over 100 Bar-tailed Godwits roosting there - sleeping, eating, and moving slightly as the tide got higher. Tin Can Bay stretches from Norman Point in the north to Crab Creek in the south. At high tide it is beautiful everywhere! Looking north toward Norman Point there are more boats at anchor. There are small boats tucked away in lots of places. There are few places for shorebirds to roost on this southern end. However, there are lots of plantings of native trees and shrubs that attract the bush birds. Because it was still early there were lots of bush birds still preening and getting ready for the day. They sat on branches, and every now and again flew off after food. Although they are honeyeaters, many of them seemed to be catching insects. There were plenty of these around - especially the small biting ones! - and I had forgotten to put on insect repellent! 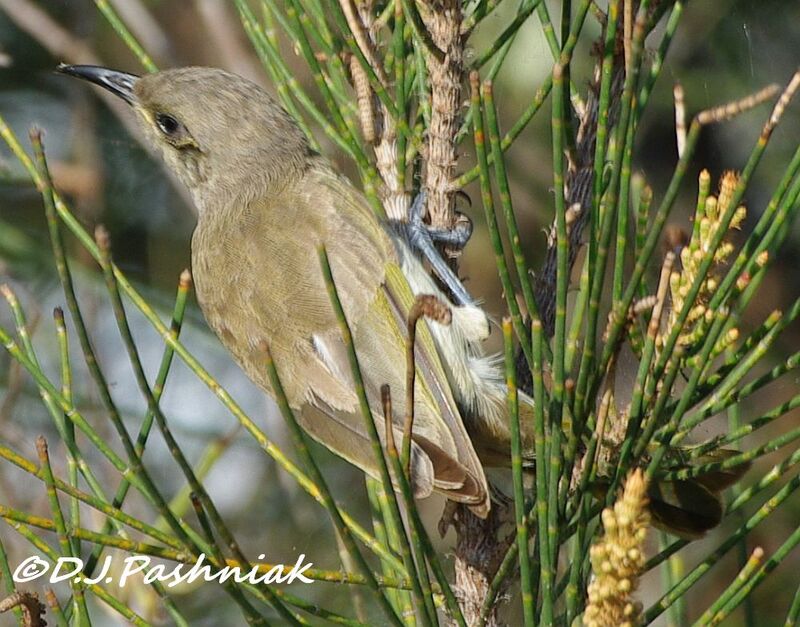 Brown Honeyeaters, and Mangrove Honeyeaters were the most numerous. 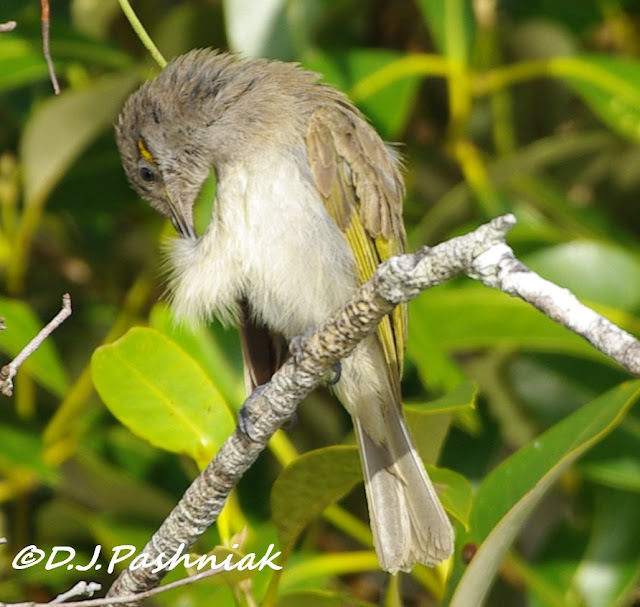 This Brown Honeyeater was making a thorough job of the morning preen. 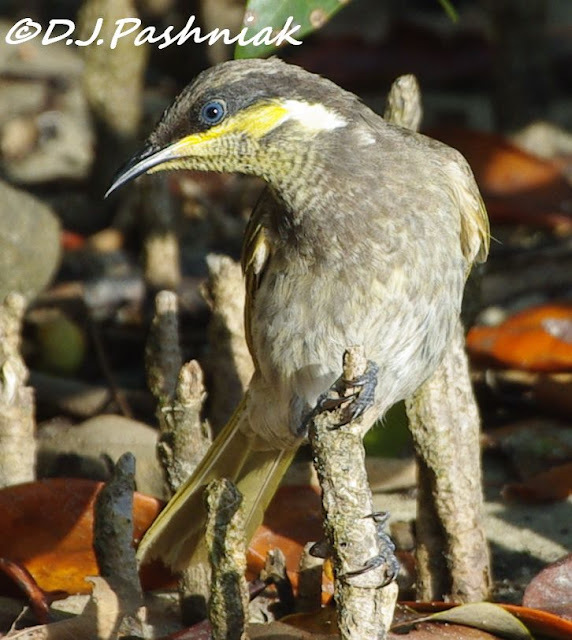 This Mangrove Honeyeater was down on the ground on the root of a Grey Mangrove tree. This Brush Wattlebird was dark against the light. 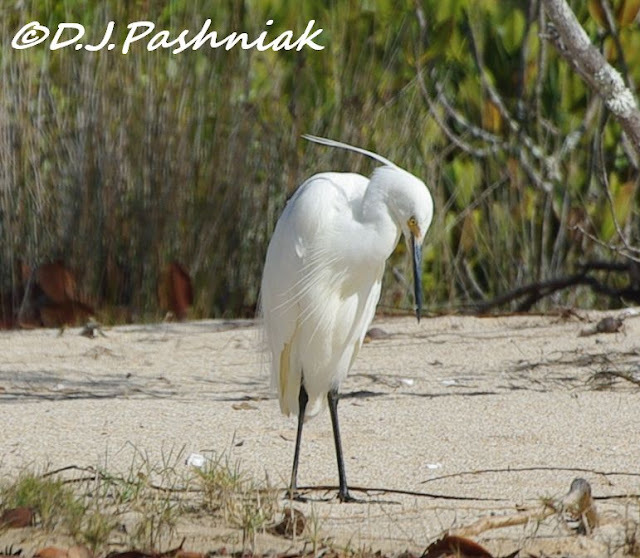 This post is for Our World Tuesday and Wild Bird Wednesday. I always have a good look along the bay when I first kayak around the mangroves at the south end of Mullens creek but the dark birds I saw in the water along the end of the sandy beach were a little unexpected. 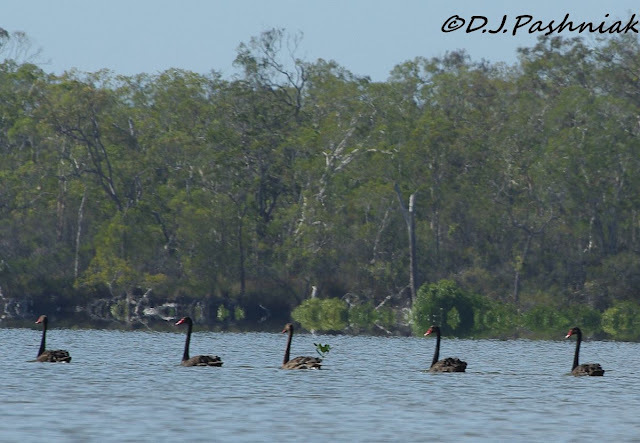 They were six black swans. I hoped for closer photos but quickly found that two legs under the water were moving a lot faster than a kayak paddling on top of the water! The sixth bird was swimming quite a long way behind the others. There is often at least one Little Egret roosting in this area but it was nice to see this one with breeding plumes on its head. I let the breeze and the tide drift me into the beach so I could get closer to the birds that were standing on the sand spit. When I got in closer the birds moved over the sand into the lagoon behind. All I could see was heads! When the kayak eventually drifted right on to the sand I found that I could get a good look by easing up onto the higher part at the back of the kayak. 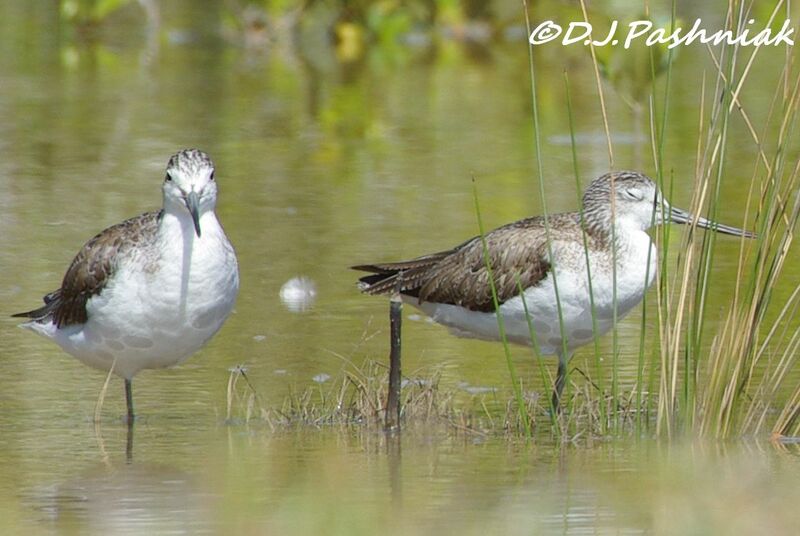 There were three Common Greenshanks and apparently they felt quite safe only seeing my head above the sand spit. They could definitely see me but after a good look at me they went back to doing their usual bird activities of eating, scratching and sleeping. I am a little late with posting this week - but - I have had two really great mornings out on the water and that took precedence! Yesterday I went by boat around to the Carlo Island North roost. I haven't been around there for nearly a year and a half so it was great to find numbers of shorebirds right where I expected them to be. I had intended to post a whole lot of beautiful pics from there - but alas! My camera stopped working! So I went and got my older camera out of its wrappings and charged up the batteries and was ready to go out this morning on a very high tide. Once again it was a perfect morning with no wind and the sea like glass. I kayaked over to the Airport Roost. This is one of the roosts that has never been counted regularly and I really want to understand which birds use it regularly and in what numbers. This morning I saw Grey-tailed Tattlers, Terek Sandpipers, Whimbrels, Greenshanks, Pacific Golden Plovers, Pied Oystercatchers and one Little Egret. 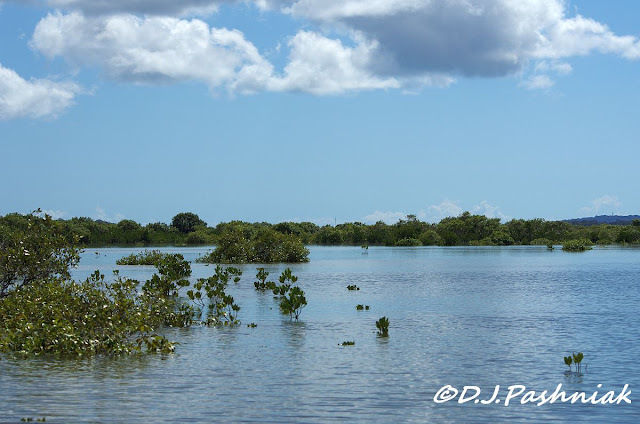 Because it was such a high tide there was a good amount of water in the little mangrove lagoon in behind the bay. Some of the birds were making use of this area as it is very sheltered and out of sight from boats on the bay. 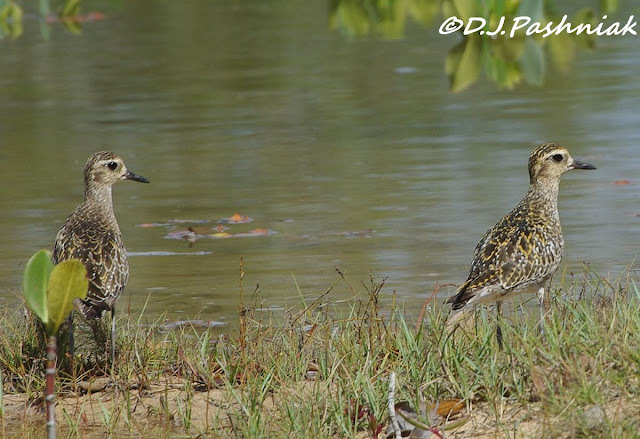 The Pacific Golden Plover were on the sand bank facing into this lagoon area. Then they moved over the sand bank and were facing out into the bay. It is not easy to get close to these birds but if you are slow and quiet in approaching them they just move off a little. They only fly right off if they are really frightened. This time they decided to roost close to a pair of Pied Oystercatchers. There are very low gradients across all of the bay around here and a few feet of water makes a huge difference to the look of a place - and to my ability to kayak around! These photos were taken last week on a high tide and a morning when there was no wind. At low tide this area has no water. All the salt marsh plants and the sand and mud are then visible. Looking south west across the Mullens roost. 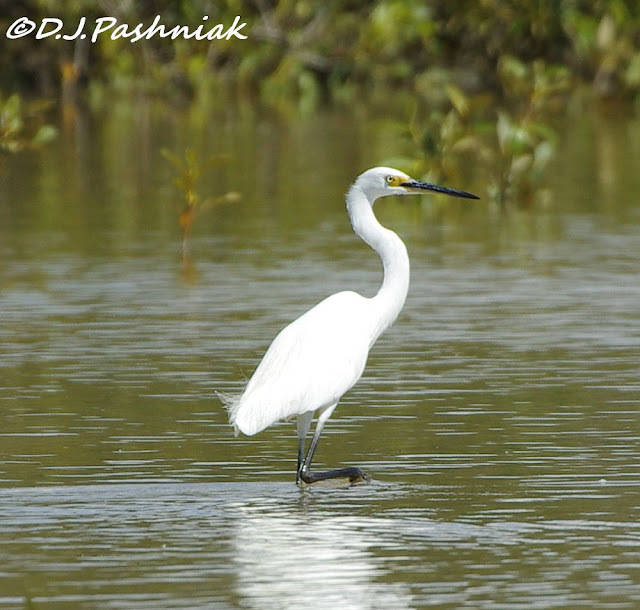 The white spot in the center of the previous photo is a Little Egret that was chasing small fish through the shallow water. Shorebirds were still flying in from other lower places around the bay when I first got there. There are always some Gull-billed Terns that use this roost along with the shorebirds. 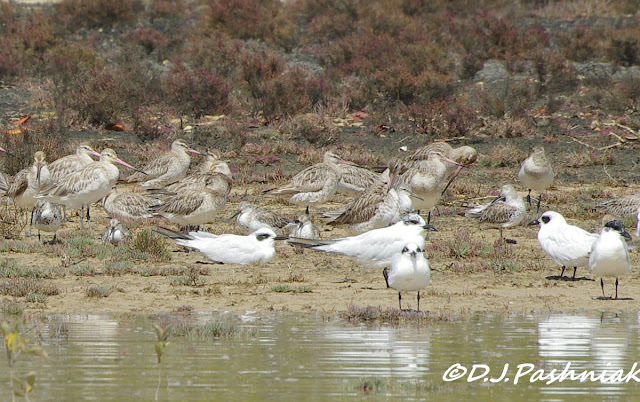 A few Gull-billed Terns were still showing a partial black cap which is their breeding plumage. 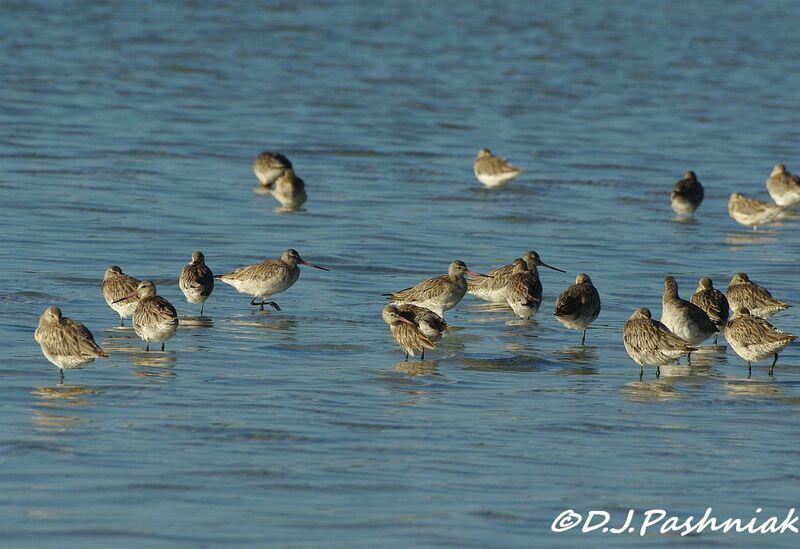 Bar-tailed Godwits are the largest shorebirds in this photo and there are also a few Great Knots. 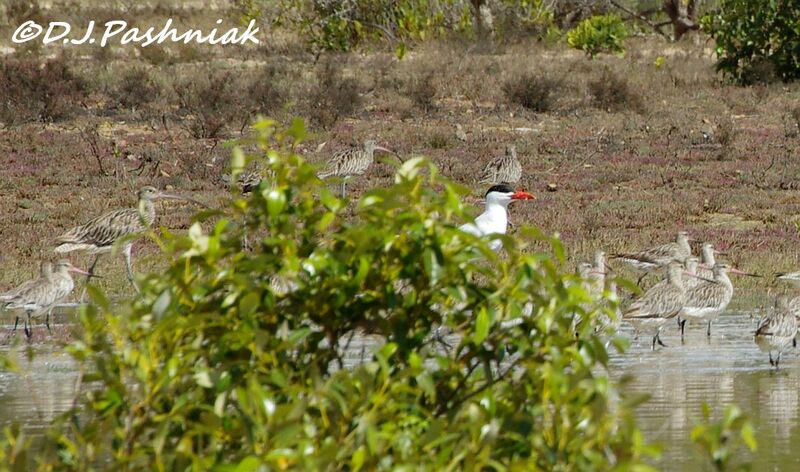 I thought all the Terns were Gull-billed Terns until I saw this big red bill showing behind the mangroves. 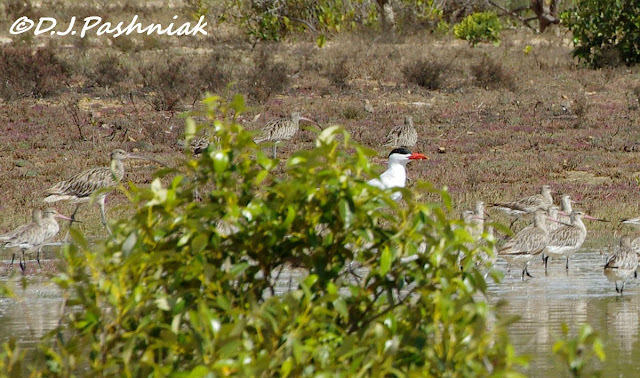 This is a Caspian Tern which is the largest of all the terns. Eastern Curlews are the largest shorebirds and easily ID'd with their very long down-curved bill. 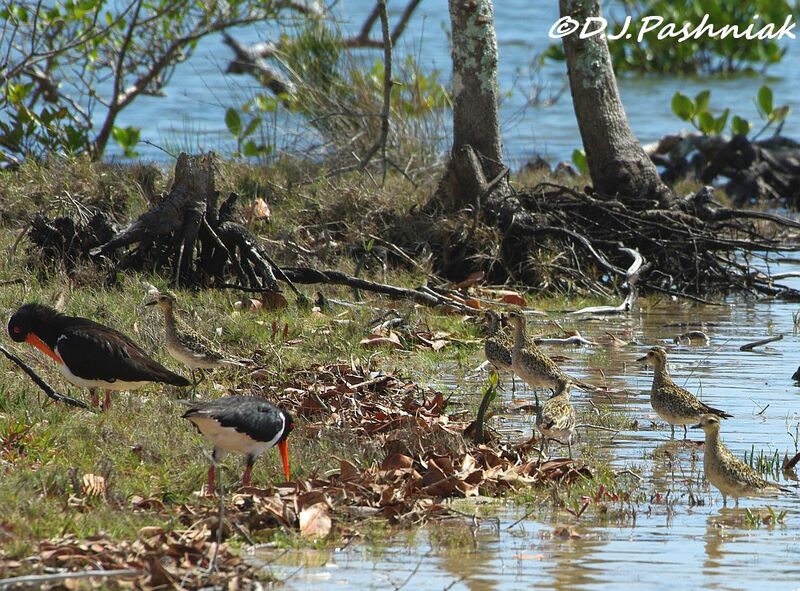 Bar-tailed Godwits are closer to the front of the photo. Looking north-east as I left the roost area. I kayaked around to the Airport roost before I went to the Mullens roost. 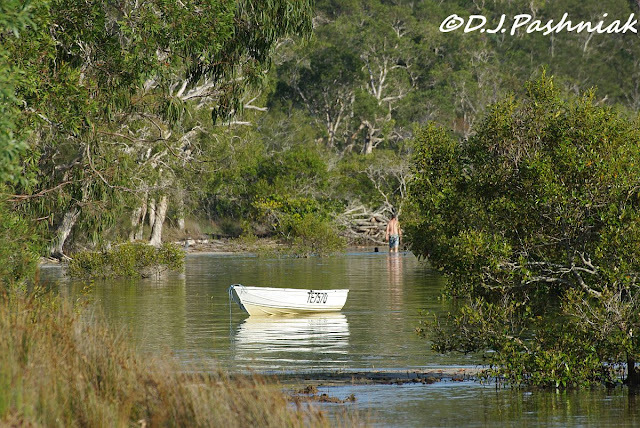 This made a kayak trip of about 6 kms - which was plenty long enough for the present! 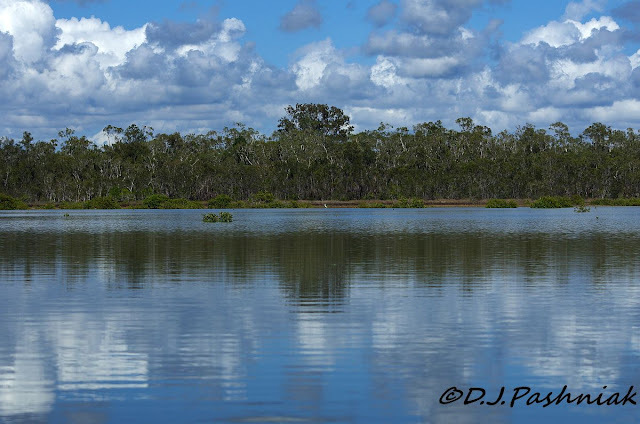 I need to do some more trips like this one before I attempt the longer paddles to get to some of the more distant roosts!